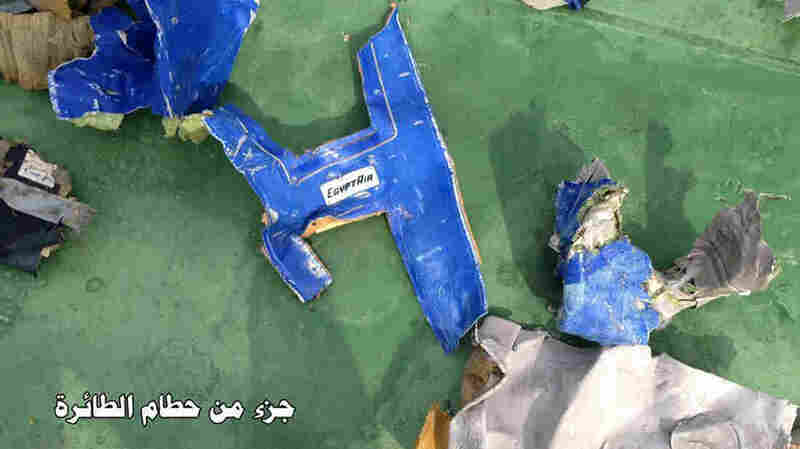 PHOTOS: Egyptian Military Releases First Images Of EgyptAir Plane Debris : The Two-Way The EgyptAir plane disappeared from radar over the Mediterranean early Thursday. It's still not clear what caused the plane to go down. Multiple reports indicate smoke was detected in the cabin. The official Facebook page of the Egyptian Armed Forces spokesman shows part of the wreckage from EgyptAir Flight 804. The Arabic reads, "Part of the plane's debris." The Egyptian military has released images of debris recovered during its search for the missing EgyptAir plane, which disappeared from radar over the Mediterranean early Thursday. The images, published on the official Facebook page of Egypt's army spokesman, show crumpled metal with the EgyptAir insignia, shredded cloth that appears to belong to a plane seat, life preservers and a pink backpack adorned with green and yellow balloons. On Friday, the Egyptian military said it found the first debris from the crash, including human remains. There were 66 people on board the Airbus A320 when it went down. It's still unclear what caused the Cairo-bound plane to crash, though smoke apparently detected in the cabin is the latest clue. Sebastien Barthe, a spokesman for the French air accident investigation agency, told The Associated Press that automatic messages from the plane indicated that smoke was detected in "multiple places" in the cabin, minutes before the plane disappeared. He says the messages "generally mean the start of a fire." Still, he says: "We are drawing no conclusions from this. Everything else is pure conjecture." As we reported, The Aviation Herald reported Friday that smoke was detected in a bathroom before the aircraft went down. The publication said this was from data transmitted by the Aircraft Communications Addressing and Reporting System to ground stations during the flight. no further ACARS messages were received"
Industry analyst Robert W. Mann tells The New York Times that these messages "did not necessarily mean that there was a fire." He adds: "The messages could also have been prompted by rapid decompression of the aircraft, which can produce condensation that the plane's sensors could mistake for smoke." Egyptian officials have said terrorism is a more likely explanation for the crash than a technical issue. Egypt's Civil Aviation Ministry has launched an investigation into the crash, which includes French investigators and an Airbus representative. The search continues for the plane's flight data recorder, the investigation's head Ayman el-Moqadem tells Egyptian state-run newspaper Al-Ahram, adding that it has "large importance" to the investigation. A Civil Aviation Ministry official has denied reports that the recorder was recovered, according to independent daily Al-Masry Al-Youm. And as the AP reports, "French aviation investigators have begun to check and question all baggage handlers, maintenance workers, gate agents and other ground crew members at Charles de Gaulle Airport who had a direct or indirect link to the plane before it took off, according to a French judicial official."